How many of you lost typed text in browsers due to some crashes, unexpected errors etc., don’t you feel writing the same text again is tedious process? 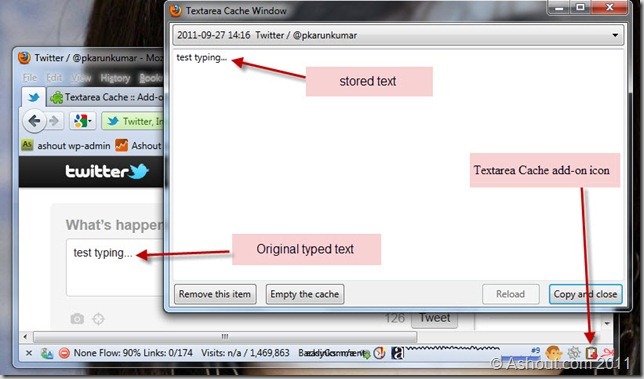 Then here is solution to recover recently typed text in firefox browser with the help of “Textarea Cache” add-on. There are some unexpected error occurs in our browsers. If such errors occurs in our browser when we have typed a long email, comment or anything we have typed, more chances are there that we are going to loose all the typed text in our browser. And there is no ways to recover such typed text. But now there is one beautiful firefox add-on is available to save all typed text in firefox browser. This add-on automatically saves all the typed text in firefox browser and can be recovered easily when we lost original text in firefox browser. To use this textarea cache add-on first you need to download firefox browser. If you already have firefox browser then install textarea cache add-on to your firefox browser and then restart your firefox browser. To test how Textarea cache add-on works, just visit any website and type any comment, now see the Textarea cache add-on icon on status bar and open it you will see the recently typed text in organized manner. Now onwards we don’t need to worry about loosing typed text in firefox browser. although suffered from this issue every now-and-then, but never occurred to me that there could be an add-on present as a solution to it or/and to search for it. thanks for sharing info on this useful add-on!